For a large part of the past decade I have been growing, hacking, digitizing, building, and thinking about beehives – particularly those in urban areas. Collaborating with biologists, designers and engineers, I have been re-conceptualizing what a beehive is and what it can be. This has lead to the speculative bio-art project ‘The Intelligent Beehive’. 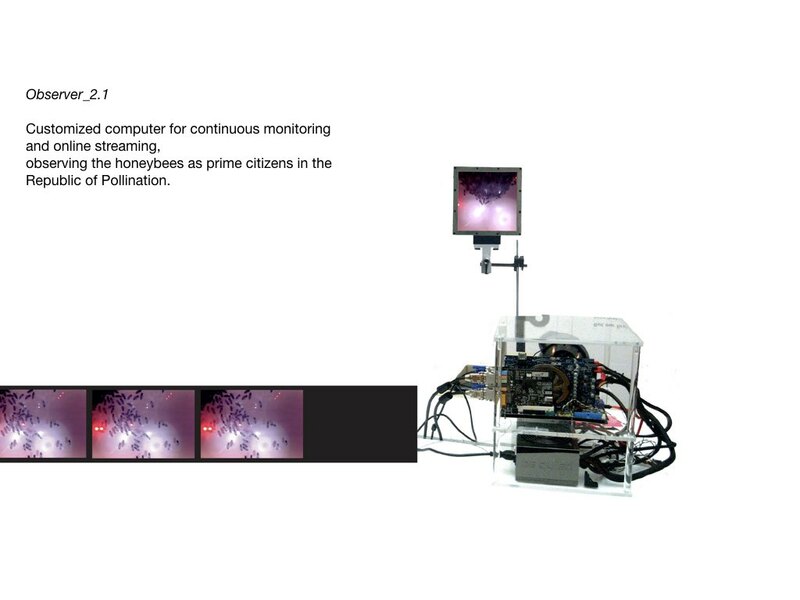 The project imagines a new kind of beehive which is both a safe, healthy haven for swarming urban honeybee colonies as well as a device for monitoring their behavior. This long-term project has been an incredible source of inspiration for artistic research into issues of ecology, architecture and social sustainability of urban environments. 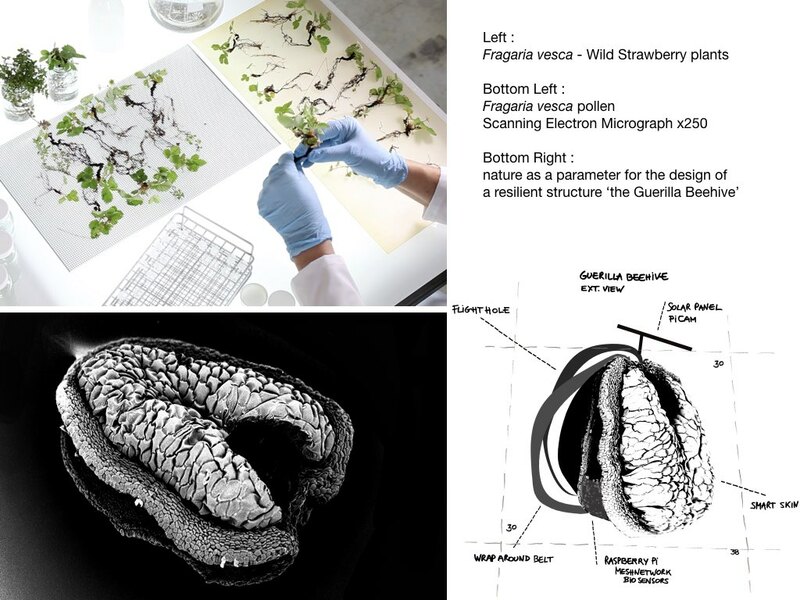 My research navigates between experimental urban horticulture, scientific research, and metabolic sculptures. My experiments connect living, intelligent systems and biotechnology with artistic and technological prototyping and experimentation. The toolset includes microbial life and material science, as well as various measurement and information technologies such as scanning electron microscopes (SEM), sensors, Big Data cloud storage, signal processing, and Artificial Intelligence. 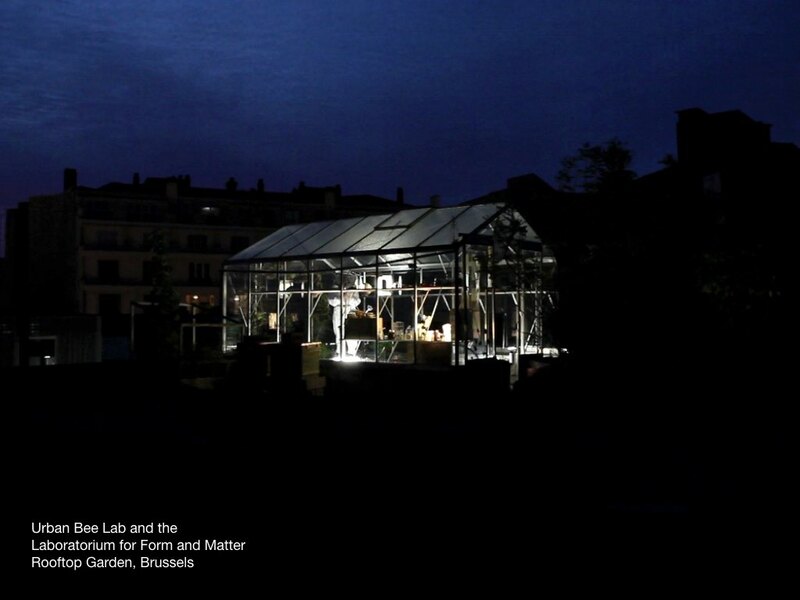 The artworks that result follow a complex work-methodology combining first-hand observation in research gardens and rooftop apiaries, laboratory probes, and digital monitoring. My work not only gives rise to fascinating images, useful ecological data and new ideas for building sustainable beehives. It is also a political statement, arguing for the integration of nature as a social/sensory/phenomenal living matrix. 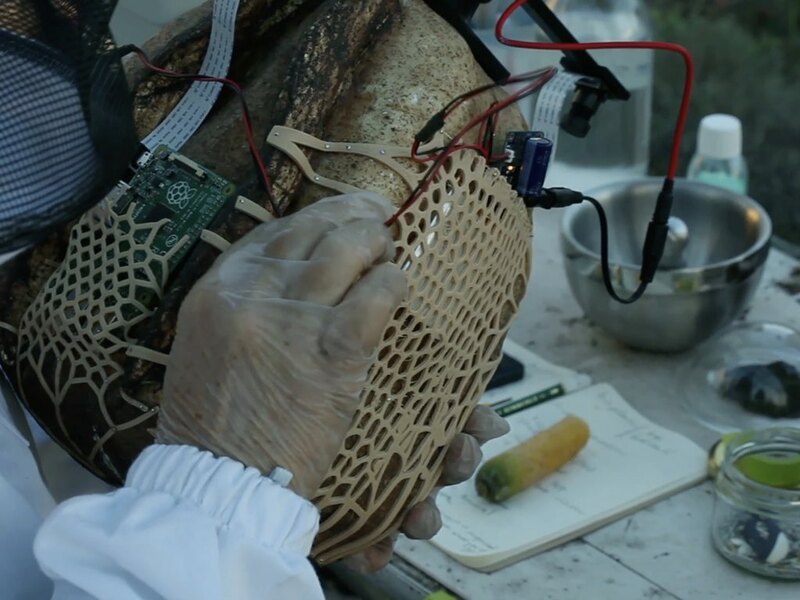 This matrix takes shape in collaboration with bees and their urban foraging. The resulting theory and practice emphasizes fairness to nature. Specifically, it draws attention to the fragile affinities between humans, bees, bacteria, and the urban neighborhoods they symbiotically inhabit. 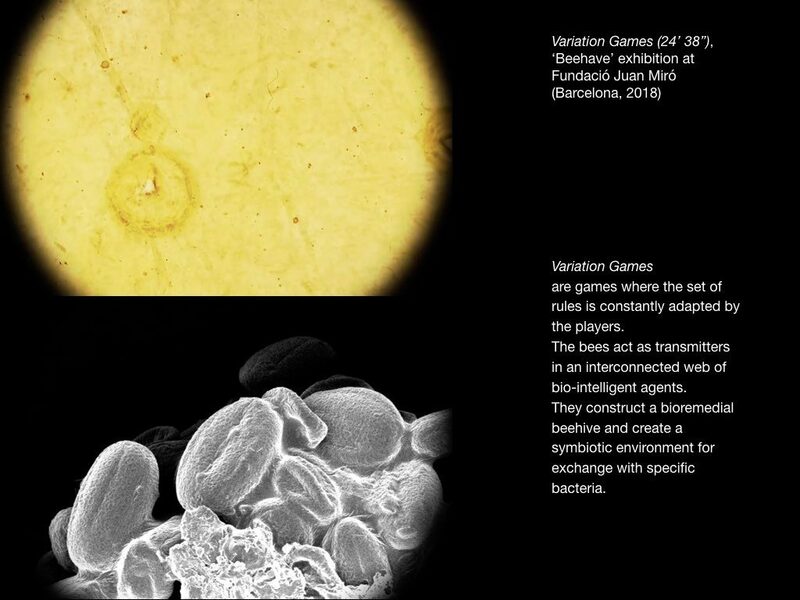 The images in this presentation will illustrate both the laboratory setting and some of the art works that have come out of the Intelligent Beehive project. 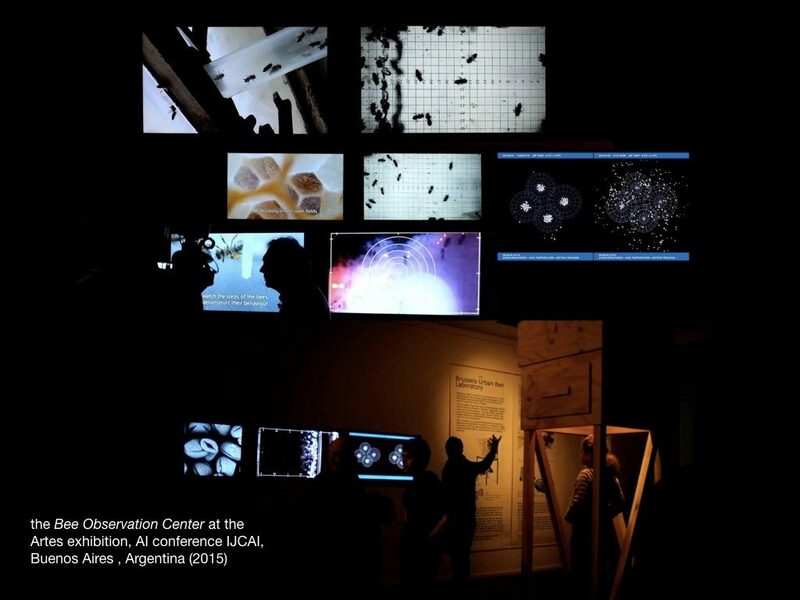 From left to right, clockwise: the Intelligent Beehive at Ars Electronica, 2017; the Intelligent Beehive at Ispra/Milano, Museum of Technology (2017); Variation Games (video, 2018) at Fundació Miró, Barcelona; Hortus Experimentalis at SO-ON, Brussels (ongoing) and the Invisible Garden at the Green Light District, Kortrijk (2014); the Scaffolded SoundBeehive at Centro Luis Borges, Buenos Aires (2015); the Heart Beehive at New Tendencies, Bozar-Brussels (2017) . 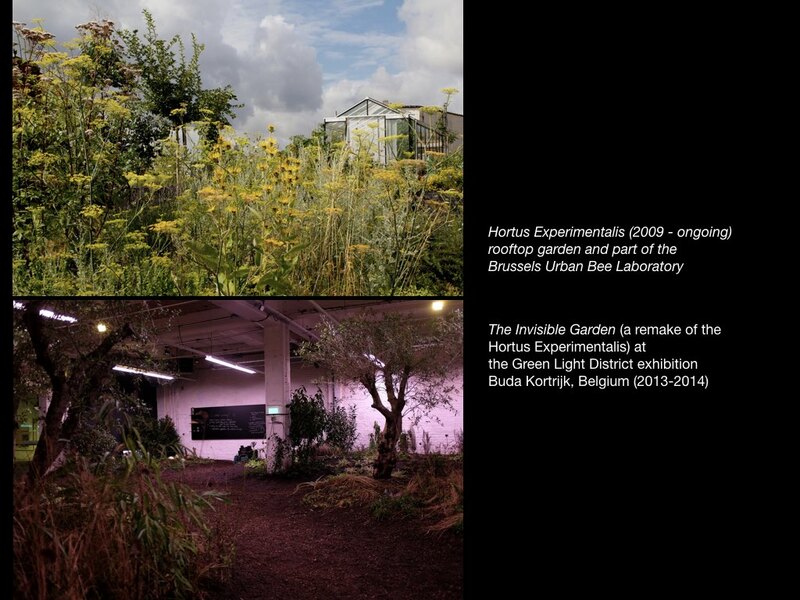 Most of the fieldwork is carried out in the Brussels Bee Laboratory, an open-air lab which includes a 750 m2 rooftop garden directly connected to my studio in the center of Brussels. 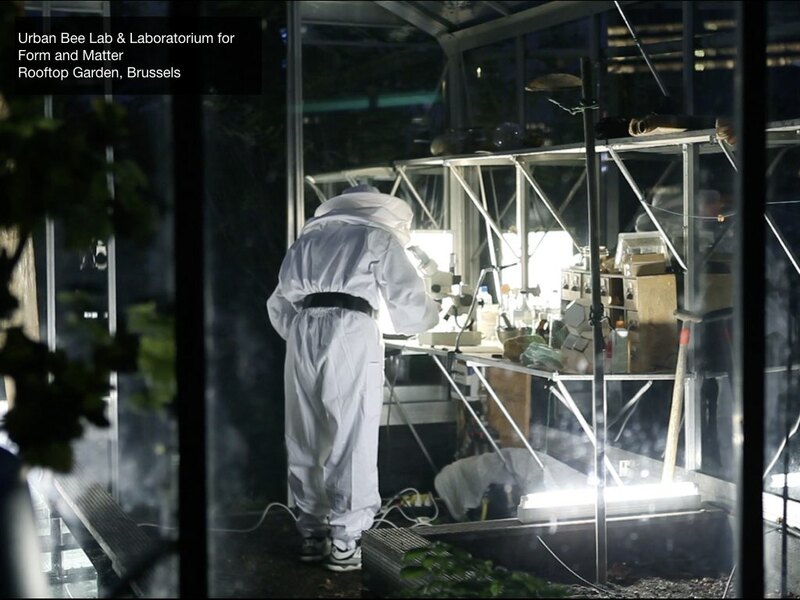 The lab contains a section where I grow plants for my biological experiments, as well as a set of custom-made observation beehives that are augmented with monitoring technology and that are streaming huge datasets on bee behavior to local servers. Bees are important bio-indicators. They reflect the health of their surrounding ecosystem as well as the cumulative effects of different pollutants. Given the decline of the bee colonies worldwide, it is important to map air pollution, the compromised state of their foraging fields and the presence of pesticides and parasites. In cooperation with researchers from the Artificial Intelligence Lab of the Free University of Brussels (VUB) we started analysing this data using sophisticated pattern recognition, AI technologies, and we have used computer graphics for making these patterns accessible. 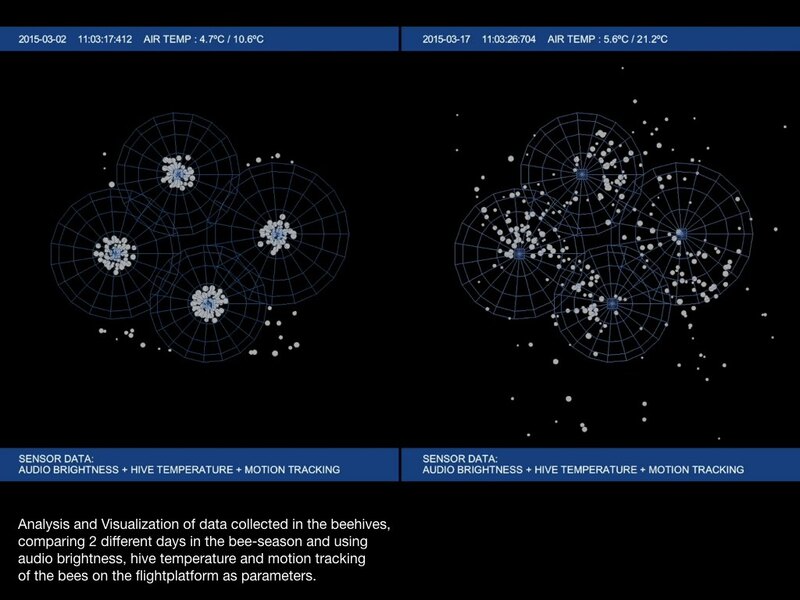 The project has included an experiment in Deep Learning to interpret the activities in the hive based on sound and microclimate recording. 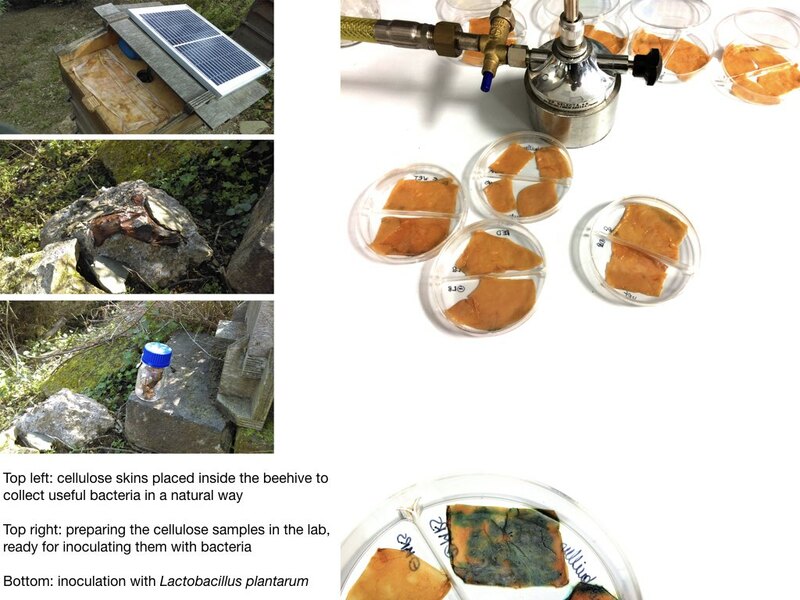 The conclusions of these observations formed the basis for the development of the Intelligent Beehive: make the transition from green technology to biotechnology and grow a radically new beehive from scratch. A beehive that is tailored to the needs of the bees instead to those of the beekeeper. Adding symbiotic bacteria to the skin of the hive might create a favorable ecology to support the bee colonies in their survival and hence reinforce pollinating tasks and protect the biodiversity of the environment. Figure 2. 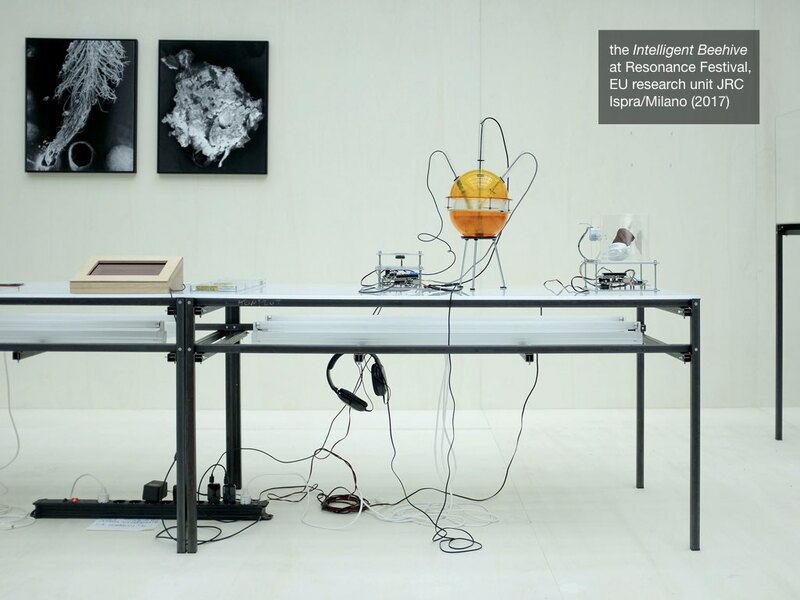 Clockwise, from left to right: The Laboratorium for Form and Matter, Brussels (ongoing); Researcher/Beekeeper at work; customized streaming computer; bee colony observation, data analysis and visualization. 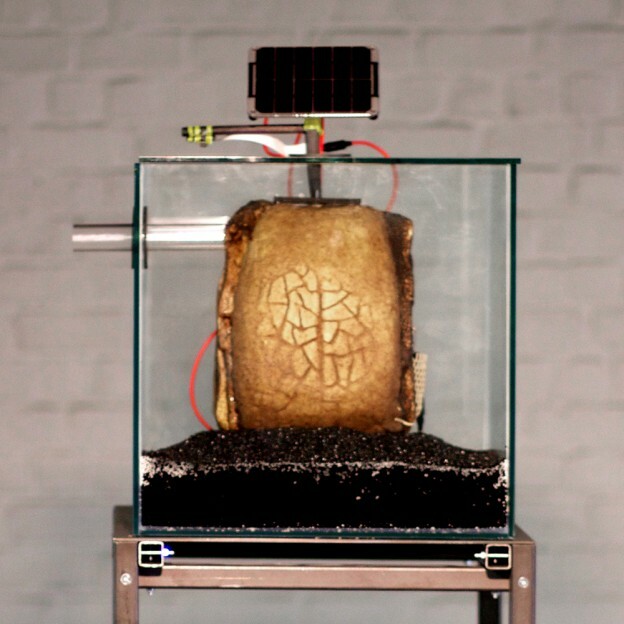 The Intelligent Beehive serves as a physical model for biological actions in conjunction with technological fabrication (3D printing, laser cutting, CNC milling). 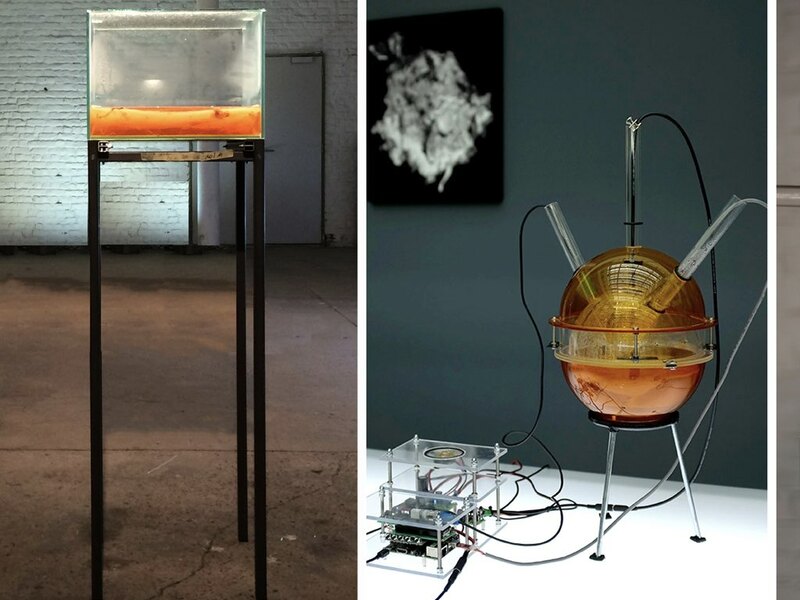 It is appropriate to envision a metabolic sculpture, a ‘living machine’ expanded by green technology (solar panel, camera, Raspberry Pi computer) and by living technology: bacteria. 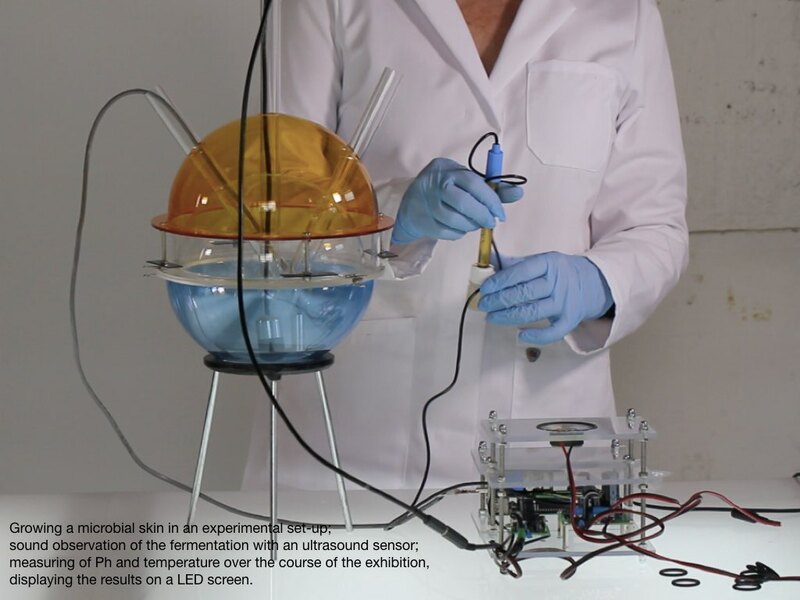 This vision incorporates bacteria as contributing agents, enabling the Intelligent Beehive to autonomously interact with the bees, mites and urban environment. 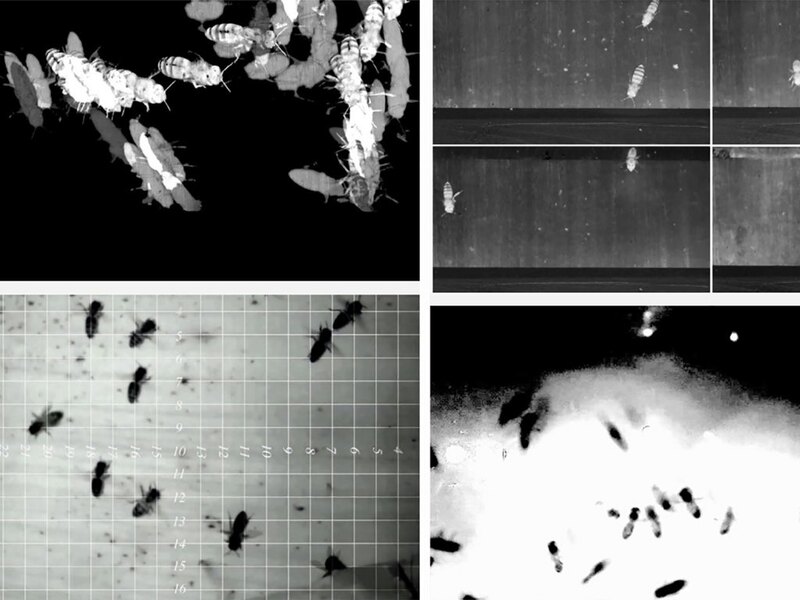 The intelligent device, combining nature and technology, calls into question not only machine-to-insect intelligence, but is also questioning how we deal with biological performance in hybrid materials. The cellulose skin which is enveloping the beehive, is augmented with a biofilm populated with colonies of bacteria. Their changing colors reflect the degree of environmental contamination. At the same time the device is monitoring the bees’ microbiome. My motto for the design of the Intelligent Beehive was: grow a resilient structure and take nature as a parameter for form. Palynology (the study of pollen grains) offered a good starting point for the first blueprint drawings of in-and outside. Pollen contain useful information on the environment, for a wide range of purposes but moreover pollen are of an extreme aesthetic beauty and their functioning is full of interesting behaviour, as there are the stomata for ventilation and thermoregulation, they can have reflective and/or absorbing textures, they are resilient for survival. They turned out to be an incredible source of inspiration. 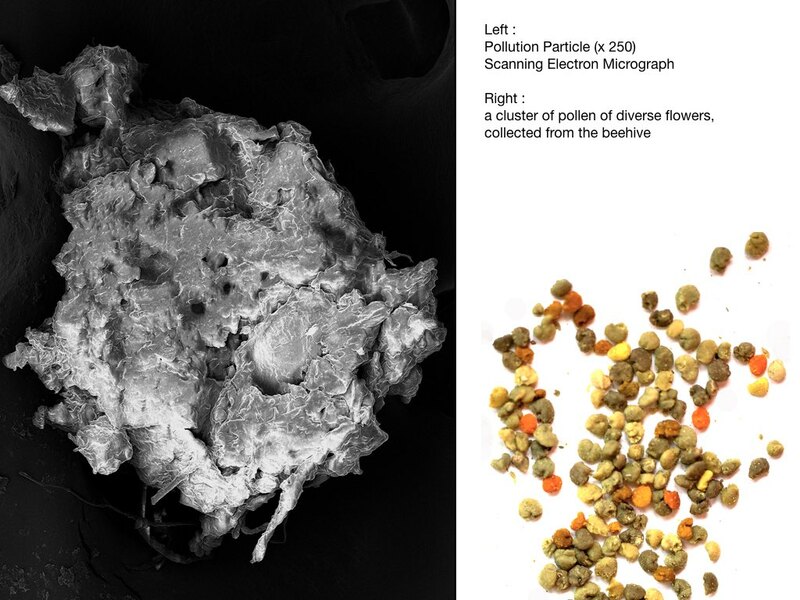 To translate these natural qualities towards a prototype created with digital technologies I needed to make an in-depth study of the pollen. I started to work with the Scanning Electron Microscope (SEM) at the Free University of Brussels (VUB). The SEM offers the possibility to visualize small 3D objects (particles) up to +20.000 enlargement scale, ideal for studying and photographing small particles as pollen grains, and pollution particles. Those particles are daily transported within the electrostatic fur on the bees’ body. 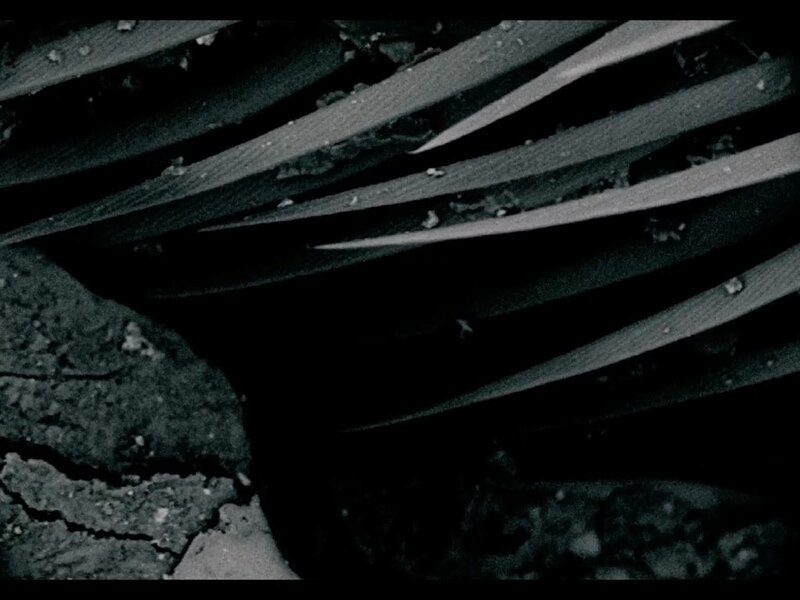 Working with the SEM gave me also a much better insight in the functioning and morphology of a bee, an important fact whilst developing a radical new hive that is bee- centred. When the bee lands upon the outer skin of the beehive, these pollution particles come in contact with the bacteria living in the upper biofilm layer which is enveloping the outer shell of the Intelligent Beehive. Figure 3. 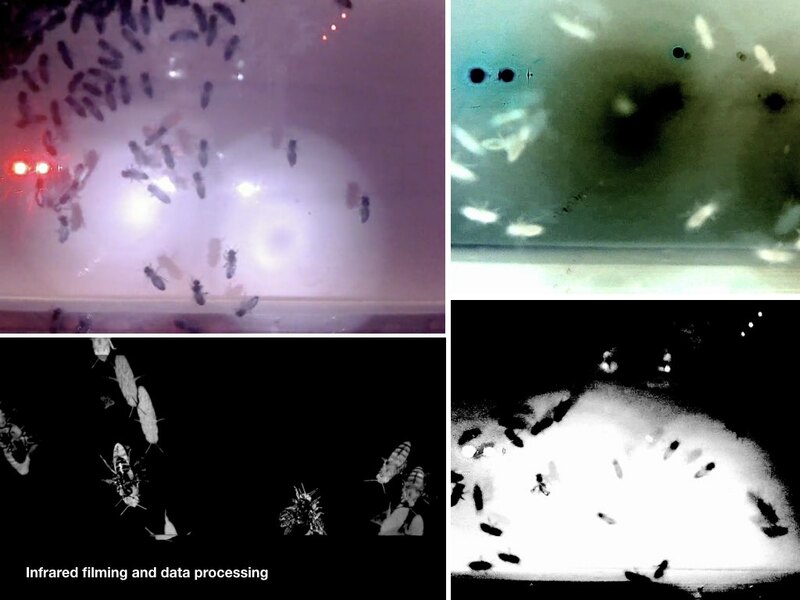 From left to right, clockwise: Prototype of the Intelligent Beehive; video still of the IB; Intelligent Beehive with bacterial biofilm; Scanning Electron Micrograph of pollution particle (x250); pollen collection; Fragaria vesca (wild strawberry) as source of inspiration; Scanning Electron Micrograph of Fragaria vesca; first draft of the Intelligent Guerilla Beehive; dust particles transported in the electrostatic loaded fur of the honeybee (video still, SEM micrograph). The research and development of the Beehive has been a constant exploration on the edge of art, science and biohacking. 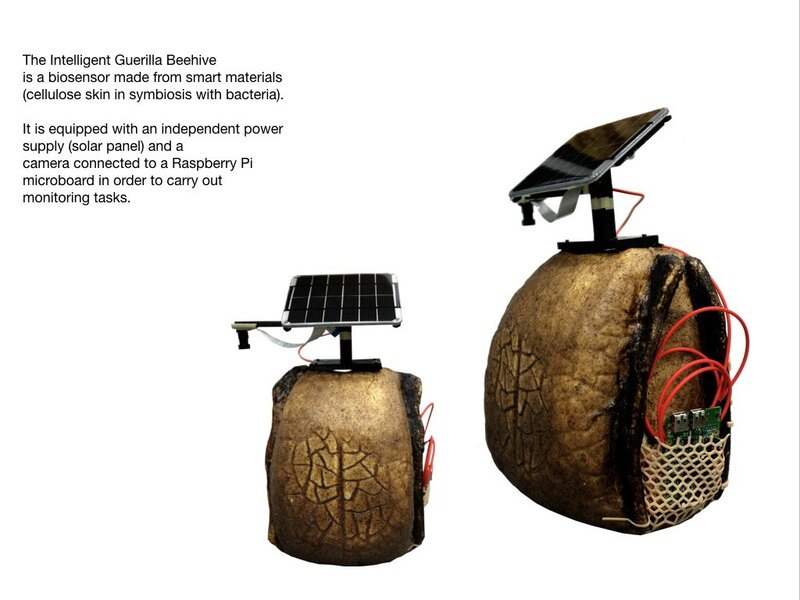 The goal is to provide a biological skin for a beehive, a skin that functions as an interface to compute and communicate the outer environmental data and the internal beehive signals. I started to work with ‘bacterial skins’ as programmable material. A ‘bacterial skin’ (or cellulose skin) is a mat-like structure build of cellulose nanofibers by the Acetobacter xylinum bacteria. The skin is a by-product of the fermentation process which occurs in a symbiotic action with the yeast cells.The cellulose skin protects the fermenting sweet tea –the growth medium- from invasion by wild bacteria and yeast cells. The low pH of the culture disrupts the cell membranes of unwanted bacteria. Moreover, several of the healthy organic acids that are creating the low pH demonstrate specific antibacterial, antiviral and other antimicrobial properties. This is one of the main reasons why I choose to work with bacterial skins as a primary medium for growing the Intelligent Beehive. Different qualities of microbial skin were being examined in terms of strength, water resistance and host-aspects, namely as growth medium for the bacterial colonies that would live in the outer biofilm. I was growing hundreds of microbial skins in containers of different sizes, and in a range of different environmental conditions. Observations made clear that the warmer the temperature the faster the bacteria were layering their cellulose nanofibers that form the matrix of the skin. But also the freshness of the scoby, the quality of the tea leaves in the growth medium (green, black or perfumed) and the airborne spores of yeast specific to the location in which the containers are stored for growth (conflictingly or harmonious) are important parameters for growing a healthy and strong membrane. Besides growing skins in flat containers, I was experimenting with different technologies to create the skin from scratch on a 3D printed skeleton, a scaled model of the beehive. With DIY technology as Raspberry Pi and a stepper motor, I installed a continuous turning system in a container filled with growth medium. 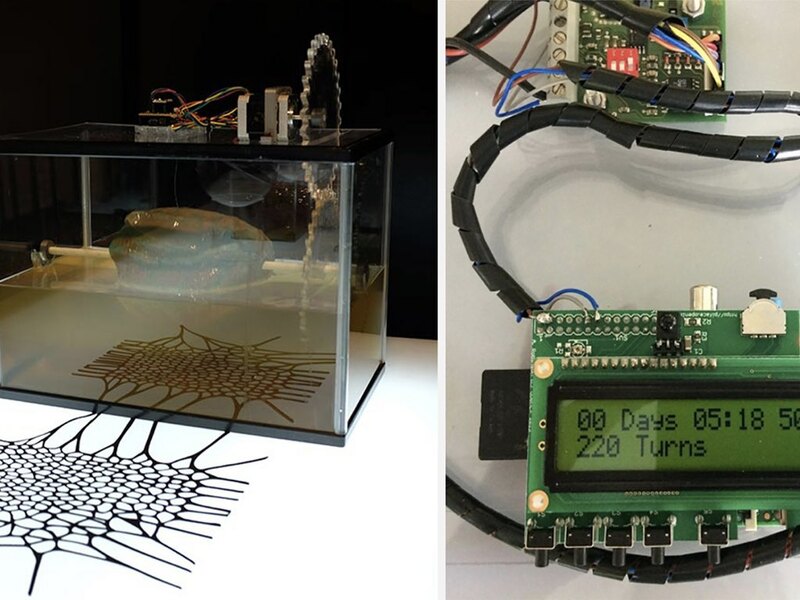 The number of turns of the object and growing amount of days were displayed on a LED-screen. The bacteria were growing the cellulose fibers from scratch around the model. Over the course of the 6 weeks-exhibition, they were creating a cellulose fabric of 6mm around the model whilst it was slowly turning around in the growth medium. 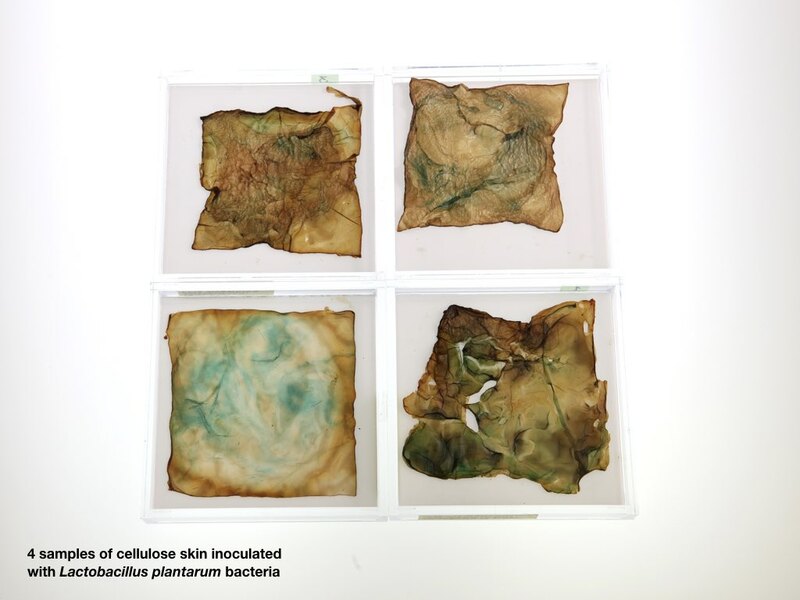 The main question was whether the cellulose skins would be a valuable host medium for biofilms filled with a different strain of bacteria, that are useful for environmental sensing. If so, then the multiplexed membrane could become a real smart fabric with integrated elements for sensing and actuating, for computation and for communication. 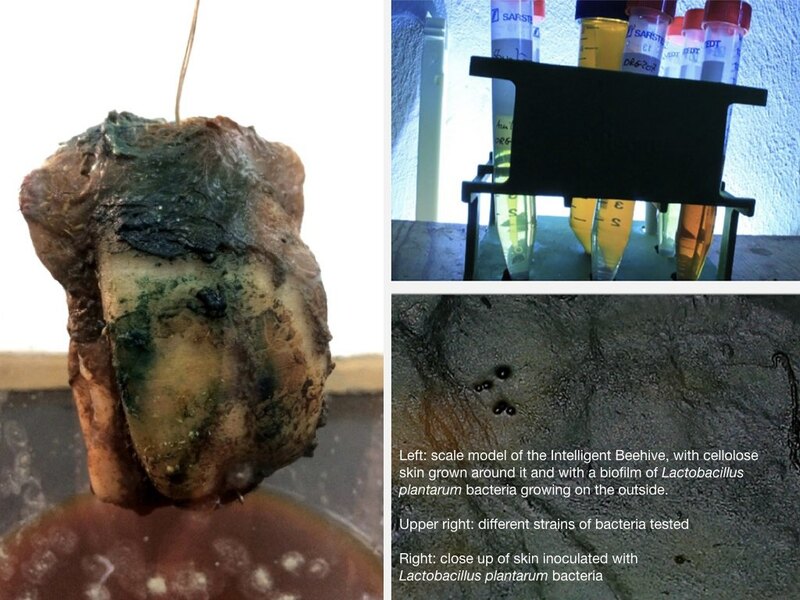 Thus after growing the skin around the object, it was inoculated with a strain of pollution-sensing bacteria (in casu Lactobacillus plantarum.) They started to grow on their host – the cellulose skin- and colonized it with a supplementary biofilm. As such, the beehive was becoming a sensing device. 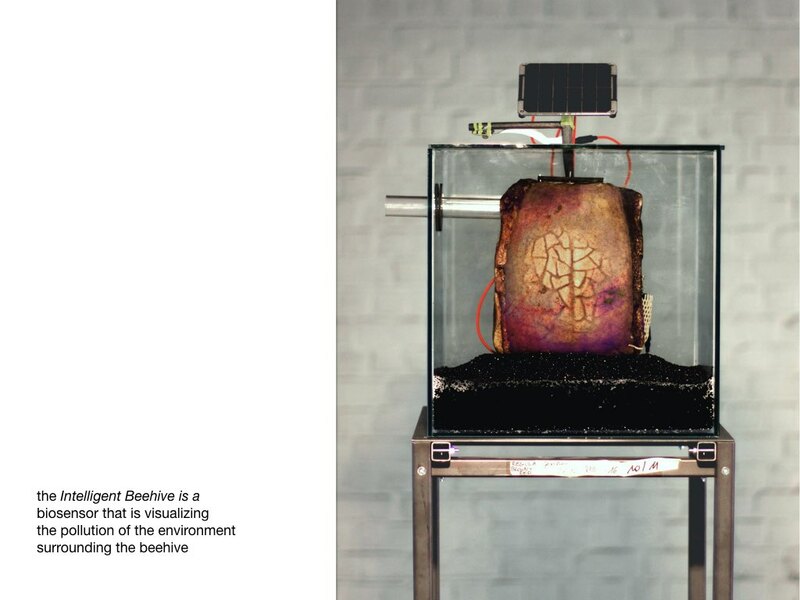 The double-layered skin of the Intelligent Beehive is from now behaving as a bio-digital living system, the living matter itself -the bacteria- are becoming the monitoring technology. 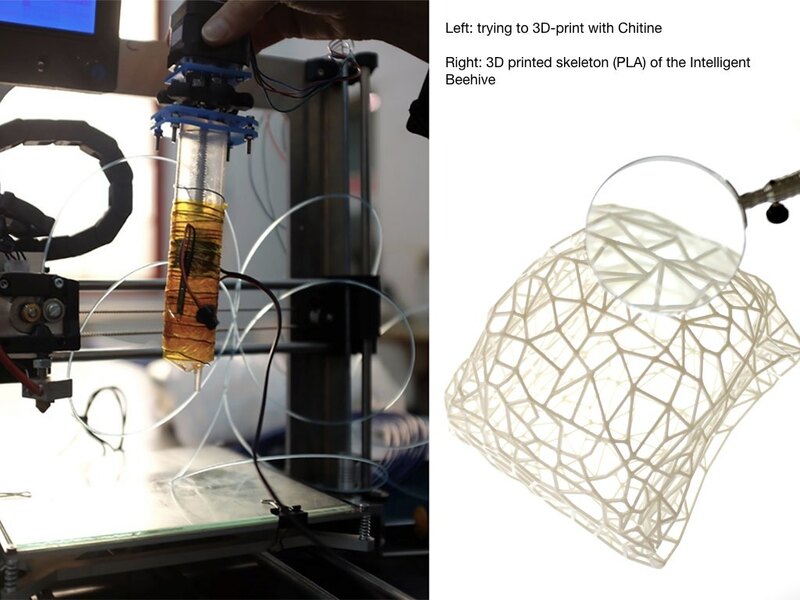 Initially, the idea was to 3D-print a chitine-skeleton for the Intelligent Beehive, on which later the cellulose skin would grow. Chitine is a product that can be found in all organisms with an exoskeleton. Mixed with solutions of glycerol it can be used as a material for 3D printing. As such, dead bees could become providors of the chitine material to start growing the hive from scratch, making it a cradle to cradle operation. But the tests with chitine (mixed with different percentages of glycerol or with crystal cellulose) have been proven that 3D-print with chitine is very complicated. The matter must be heated up to 75°C and needs to be stirred for at least 5 hours continuously. I was able to make 2D drawings with a seringue that I was using as a simulation tool for a 3D print head, and the results initially turned out to be satisfactory, but the outcome is still miles away from the strong material we need to make solid 3D-prints. 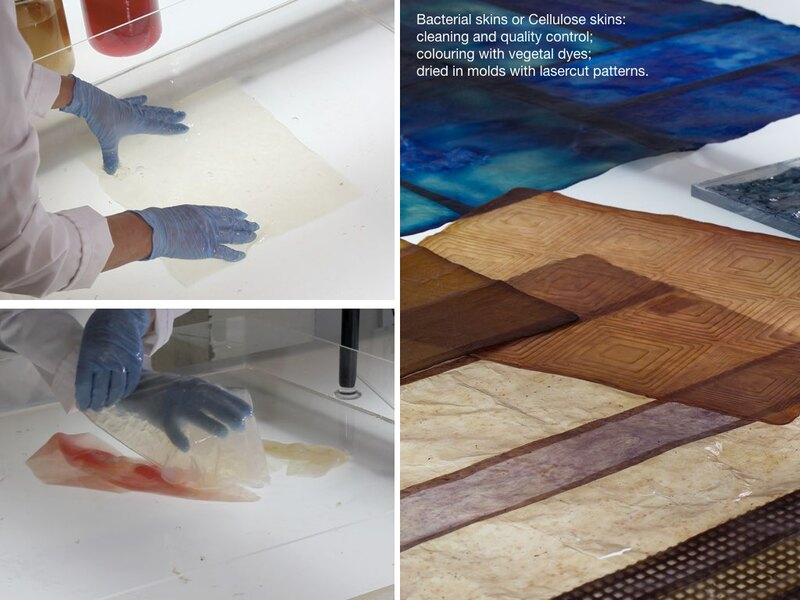 In parallel experiments I was investigating the possibilities of adding chitine on top of the microbial skins, to enhance the skins’ qualities of waterproofness and strength. I carried out a series of tests with different compositions of chitine on top of the wet and dry samples of cellulose skin. The trick was mixing the chitine with the right amount of glycerol so that the cellulose skin would not curl once the chitine was drying. Figure 4. 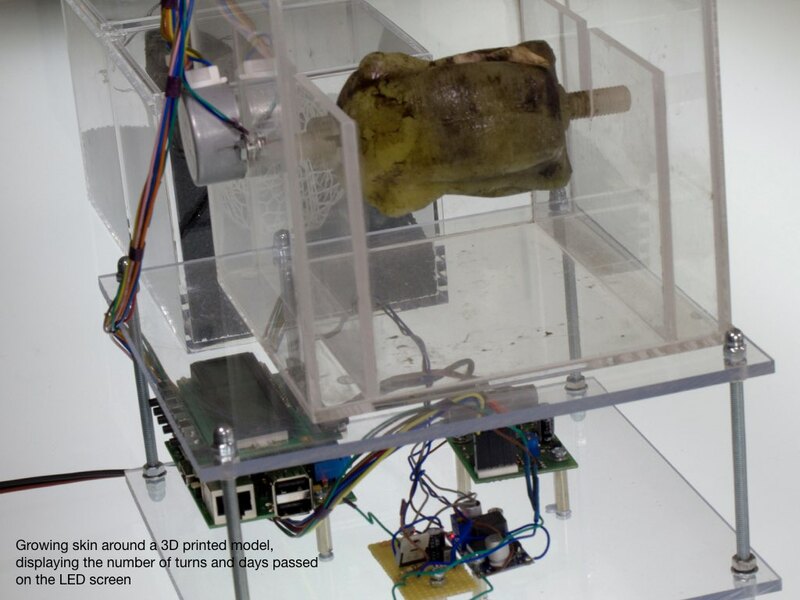 From left to right clockwise: cleaning and testing wet cellulose skin, quality control; experiment to monitor the Ph, T°and ultrasound of a growing cellulose skin; experiment to grow cellulose skin around a turning object; cellulose skin around an object covered with a biofilm of Lactobacillus plantarum; IB skeleton, 3D print; tests to 3D print with chitine. The last phase in the project was the search into finding the right strain of bacteria to populate the biofilm. Requirements are i)resilience in diverse environmental conditions and ii) color changing qualities when a specific ecological threshold is passed. To start this experiment, I left some wet cellulose skins in a beehive for a few days on which I was hoping to collect interesting bacteria in a natural way. I made several swabs of these skins and these results were put to growth in a sterile container with medium. In a second phase I brought strikes of this medium to culture in petridishes. Several strains of bacteria have been recovered from those samples but most of them were not useful for the experiment. After a series of attempts to make the bacteria grow on the cellulose skin, I have been concluding that only the Lactobacillus plantarum and the Janthinobacterium lividum (2 strains that were bought) were able to survive on the skin. Bacteria from these 2 strains do not only grow into a biofilm, they also change color when a modifier threshold (pollution, pesticides) is passed. Following these results, I have been inoculating freshly grown skins with Lactobacillus plantarum bacteria and with the presence of X-gal (a modifier which is used in molecular biology to test for the presence of a specific enzyme) the bacterial colonies were changing into a greenish- blue color, which is clearly visible on the cellulose skin. 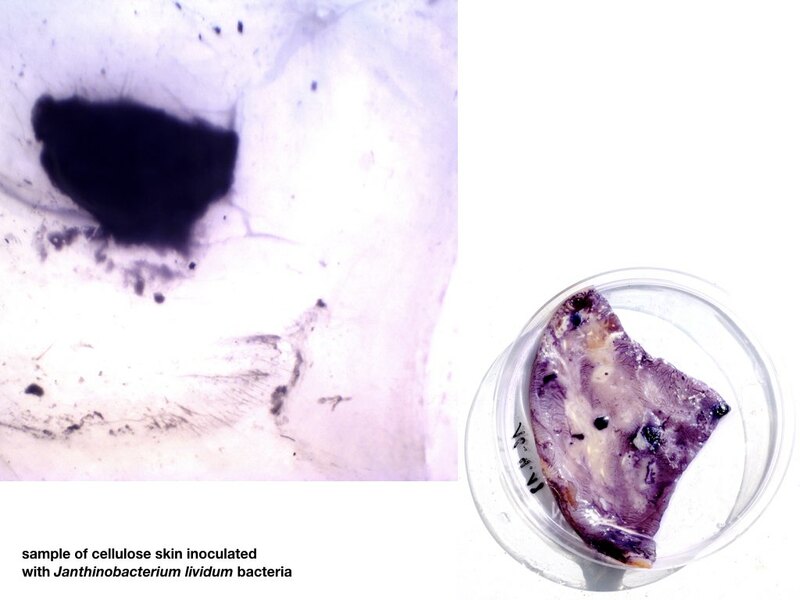 Janthinobacterium lividum, was another strain of bacteria growing on cellulose skin. As long as they are fed, the bacteria in the biofilm continuously renew in young generations, hence the cellulose skin acts as a crust that crumbles under ever new layers of bacteria. Thus the Intelligent Beehive’s outer skin is protected by a layer of living cells that constantly feed off the dead ones and thus cleans and repairs itself. Figure 5. 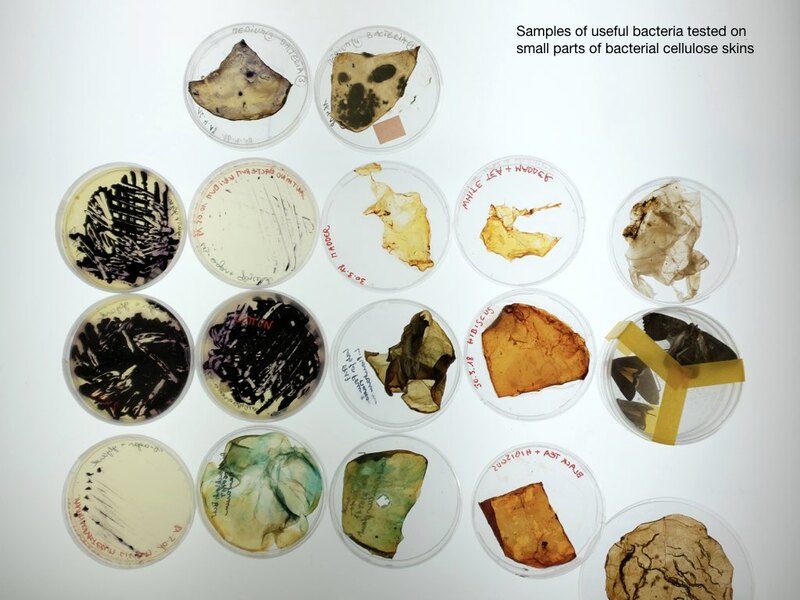 Clockwise from left to right: Samples of cellulose skin topped with chitine or with biofilms; bacteria hunting in the forest, Lactobacillus plantarum on dry cellulose skin; Janthinobacterium lividum on cellulose skin. The Intelligent Beehive hypothesis is a proof of concept. The cellulose skin produced in symbiosis by Acetobacter xylinum bacteria and yeast cells proves to be a good scaffold for growing bacterial biofilms of Lactobacillus plantarum or Janthinobacterium lividum. The biofilms react on specific environmental thresholds by changing color and as such they become a biosensor. A negative point is that nor L.plantarum nor J.lividum are resilient to extreme heat or humid weather conditions. These bacteria only grow in a protected environment and when they get a steady flow of growth medium. Further search for the right bacteria strain is thus needed. Probably this problem can be solved with the implementation of synthetic biology. More research needs to be done into i) the water resistance of the cellulose membrane (maybe check with the leather-industry? 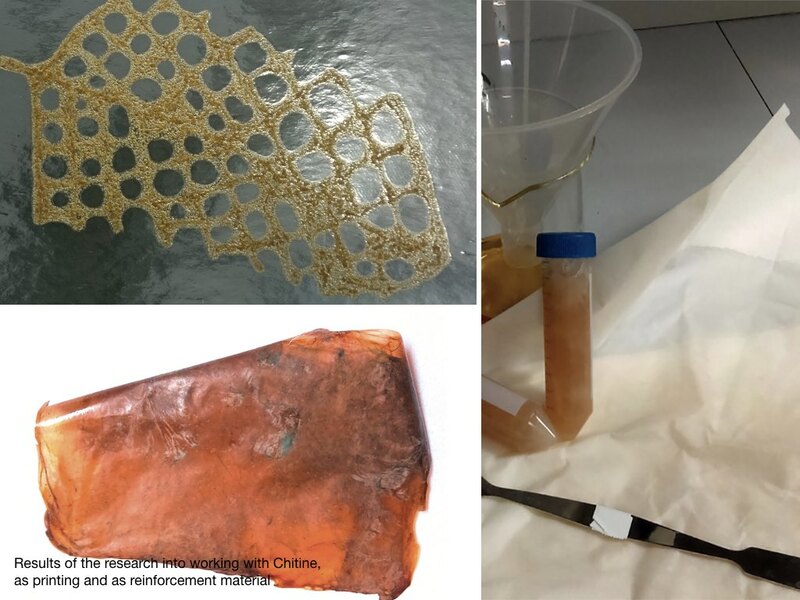 ), as well for ii) 3D printing scaffolds with chitine/chitosan. We need support from a professional laboratory with the right high-end equipment to bring this project to a good ending. Figure 6. 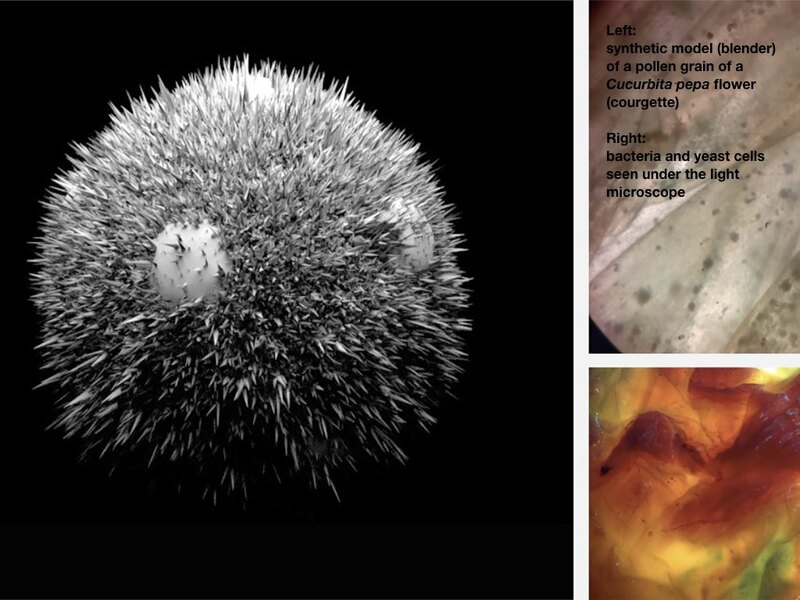 Clockwise from left to right: 3D model of a pollengrain of Cucurbita pepa; biofilms; bee observation (video stills). DIY bioLab Barcelona (Dr. Núria Condé Pueyo, biologist and computer scientist) was the main partner regarding biological research for the Intelligent Beehive project. FabTextiles Lab Barcelona (Anastasia Pistofidou), part of the FabLab Barcelona was helping out with digital prototyping. Members of the Brussels Urban Bee Lab that helped to realize several experiments include Vincent Malstaf and Joeri Bultheel. I thank also Dr. Laura Gribaldo, microbiologist at JRC Ispra, for her valuable support and advice and Dr. Alexander Lutz (VUB) for operating the Scanning Electron Microscope. 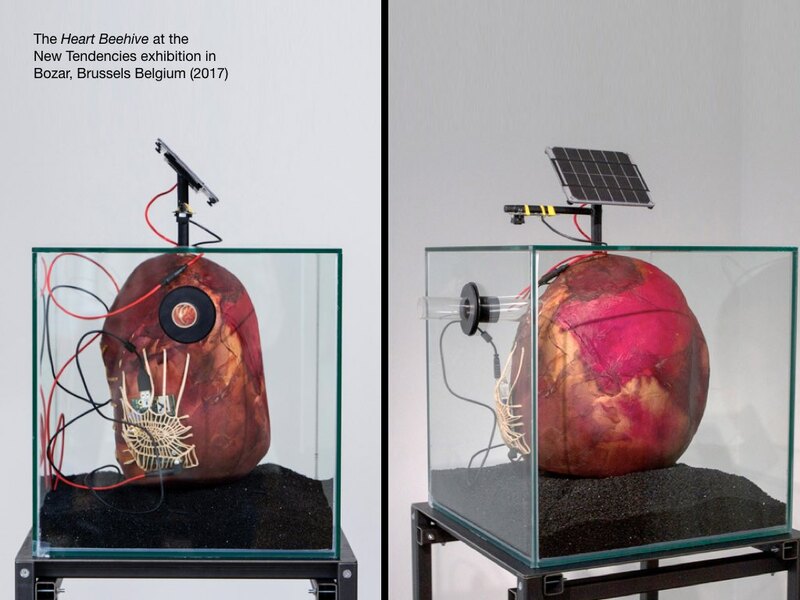 Special thanks are going to Dr. Dennis Dollens, who was regularly blogging about The Intelligent Beehive project in relation to his own research in Autopoietic, Bio-digital and Metabolic architecture, and who was stimulating me to reflect on my artistic research. Funding was received from the Flemish Ministry of Culture as well as from the Resonance Festival of the Joint Research Centre of European Community in Ispra, Italy. 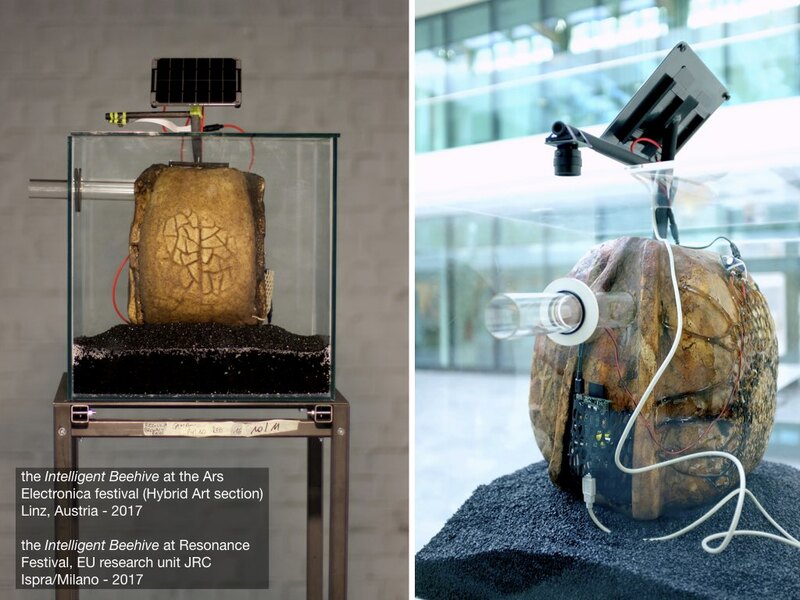 The Intelligent Beehive project was bestowed with a Honorary Mention in the Hybrid Art discipline of the Ars Electronica Festival 2017 in Linz, Austria.